The forest tent and eastern tent caterpillars are similar in habits and appearance. Fully grown forest tent caterpillars (larvae) have keyhole-like, or shoe print-shaped, whitish spots on each body segment. This fine line of spots runs down the middle of the back for the entire length of the body and along each side is a blue line. Their favorite hosts are oak, poplar, maple and birch. The caterpillars do not build nests but leave mats of silken threads on trees where they travel or rest. The eastern tent caterpillar differs in that it has a solid whitish line down the center of the back and an orangish stripe on the sides. They feed on apple, crabapple and cherry trees and build distinctive nests in forks of trees. The tent caterpillars lay their overwintering eggs (masses with a dark brown shellacked appearance) around small branches about the size of a pencil. Hatching occurs as buds swell and open, the young caterpillars feed on the buds, and the nests become apparent in late May. As the larvae grow they begin to feed on leaves. When the population increases, it is not uncommon for trees and forests to be defoliated. The caterpillars mature in the first part of June, with adult moths appearing during the last part of the month, when egg laying takes place. There is one generation per year. Forest tent caterpillars have denuded forests in many areas for up to five years in a row. Trees can usually survive such defoliation, but with reduced growth. Disease, other insects, nutrition, moisture and general poor condition may cause tree mortality in defoliated trees. Higher defoliating populations of forest tent caterpillars typically drop after two years due to natural conditions, parasites, predators, and diseases. Freezing weather shortly after eggs hatch kills large numbers of caterpillars, and excessively high temperatures later in the spring kills large numbers of adults and reduces the viability of newly laid eggs. 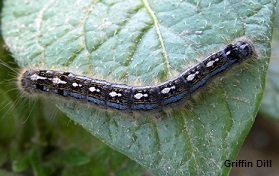 Management for the eastern tent caterpillar and forest tent caterpillar is similar, except nests of eastern tent caterpillars can be removed and destroyed. Egg masses on branches of small trees around the home can be removed and destroyed before hatching. Organic methods include using B.t. (Bacillus thuringiensis), spinosad, insecticidal soap (be careful of leaf burning) or neem against small larvae. Other insecticides include carbaryl (Sevin) and malathion.